I pulled found this on my phone as I started listening to The Elephant to Hollywood and he mentioned his previous autobiography. Being a completest, I had to stop and listen to the first book in the series. Unfortunately, I did not look at the runtime nor the fact that it is abridged. So that is on me, but on the other hand, less than three hours to cover the first 50 years of his life, I am going to guess that it was SUPER abridged. I did give the performance 3 stars because it still has Michael Caine telling his story, although it can be hard to hear through the din. The bottom line is stay away and go get the real book. Audible, you should be ashamed at this still being sold on here. What would have made What's It All About? better? It was too short, but of course that was the length of the book I would imagine. If you’ve listened to books by Michael Caine before, how does this one compare? Haven't listened to any other. What didn’t you like about Michael Caine’s performance? If you could play editor, what scene or scenes would you have cut from What's It All About?? I love Michael Caine, and in his autobiography he comes out as witty and entertaining. He has a wonderful voice and it is not at any point boring. Michael Caine's led a rags-to-riches life and has some amusing stories to tell along the way. Unfortunately his performance on this 1992 abridged reading is almost completely flat and monotone. About the only time it perks up is when he remarks, as part of a major edit in the story, that if we want to know more about his numerous films we'll need to read the book - I could almost hear him laughing as he said it. His 2010 autobiography 'The Elephant to Hollywood' (also available here on Audible) is far more entertaining and far better value too. It covers the same ground and then some - a generous, unabridged 10 hours of the irrepressible Mr Caine rounding up his life so far. Eye opening insight to Mr. Caine's poor backgroun. 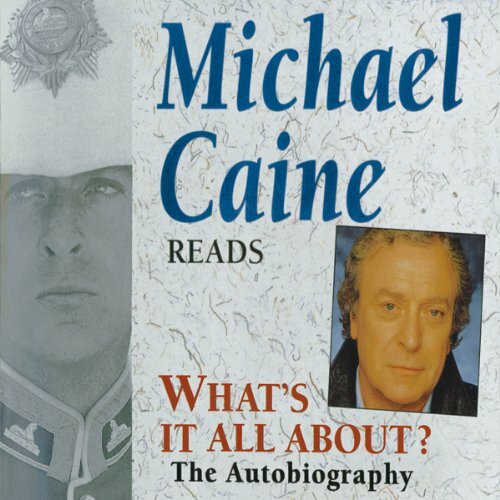 Michael Caine's self-narrated Auto Biography makes all the difference to this audible book. Highly recommend it. Unbelievable how down to earth this immensely successful A-Lister was and still is. My wife and I listened to this from start to finish within a 280mile round trip in the car. We hope there's another self-nareated Michael Caine auto-biography. my wife reas the full book, put it's not fully narrated as the book is funny according to the wife. Michael skips through this himself, and tells it as it is and as if he was in the pub talking to you. Micheal Caine gives an interesting and touching review of his life up until his 58th year. When I bought this audio book I did 't realise it was abridged so it only lasts just over two hours which was a disappointment but it was an entertaining two hours. What did you like most about What's It All About?? What was one of the most memorable moments of What's It All About?? Have you listened to any of Michael Caine’s other performances? How does this one compare?